As a stone carver, I first let the stone speak to me. The shape, colors, and texture evoke certain emotions that generate an idea. The characteristics of the stone seem to call for a specific response from me. My approach is unlike the sculptor who orders stone of specific dimensions to accommodate his plan. 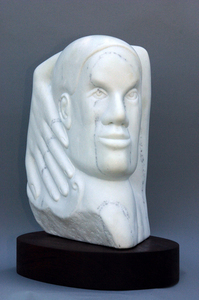 I prefer to find an interesting stone and then decide what shapes or figures lie within. In working to unlock the secrets within the stone, I also find and reaffirm the values and emotions which are most important to my spirit. In unlocking the spirit of the stone, I unlock the creative spirit within myself.